Remember that thing that happened in West Virginia, where a company called Freedom Industries leaked 4-Methylcyclohexylmethanol into Charleston's water system, depriving 300,000 people of potable water and sending at least 300 people to clinics and hospitals for medical treatment? Yeah, turns out that wasn't the only substance that was leaking into the river. 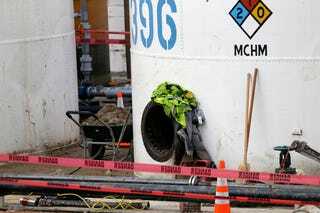 Freedom Industries acknowledged on Tuesday that the leaked material was actually a compound substance that included polyglycol ethers and is known as PPH. This CDC link was updated to include some information about this additional substance, but not all of it, because Freedom Industries considers this blend of PPH to be proprietary information. So, just to be clear, Freedom Industries knew that this was a compound substance but only initially disclosed information about the MCHM, not the PPH. Right now it seems that the PPH blend isn't more hazardous than the MCHM, but you'd think you'd have the right to information about contaminants in your drinking water.